Visa has teamed up with mobile payment technology firm, DeviceFidelity to create the In2Pay protective case for iPhone 3G and iPhone 3GS that turns your handset into a credit card. The In2Pay case uses Visa's PayWave contactless payment system where you hold your credit card up to a scanner, and your credit card information is transmitted from a small chip embedded in your card. Instead of a chip, DeviceFidelity's In2Pay iPhone case features a removable MicroSD card that stores and transmits your credit card information. To pay with your phone you activate a password protected iPhone application, and then hold your phone up to a scanner at any location that accepts contactless Visa payments. DeviceFidelity and Visa have said consumer trials for the system are scheduled to begin before the summer, but pricing and availability for the In2Pay case has not been announced. While turning your phone into a digital wallet is common in other parts of the world, most notably Japan, the technology has yet to catch on in the United States largely due to privacy concerns. Mobile payment, as well as contactless payment systems in general, rely on wireless systems that transmit your credit card information over the air. Some of these systems use radio-frequency identification, which has a fairly large broadcasting range, and the security of RFID has been called into question on several occasions. But a newer wireless communication technology called near field communication (NFC), which used in Visa's payWave system, is considered more secure and has a shorter broadcast range. DeviceFidelity says its In2Pay MicroSD cards also use an "anti-sniffing" security feature that disables the SD card's transmission abilities when it is not in use to prevent unauthorized access of your credit card information. 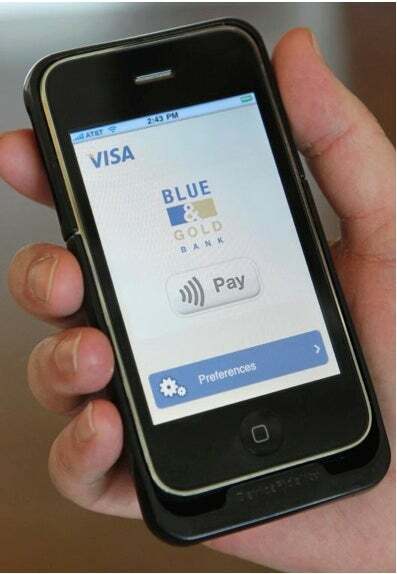 Mobile smartphone payment has become a hot topic among smartphone developers and technology companies in recent months. In March, First Data partnered with Tyfone, another mobile payment system company, to create a MicroSD card system for credit card payments similar to DeviceFidelity's In2Pay. And startup company Square, brainchild of Twitter co-founder Jack Dorsey, has introduced a new mobile payment service that uses a small credit card reader a user carries with them along with an iPhone application to make credit card payments. Square allows users to pay with their plastic at participating locations, as well as make payments between individuals for things like personal debts or items sold at a garage sale or through Craigslist.